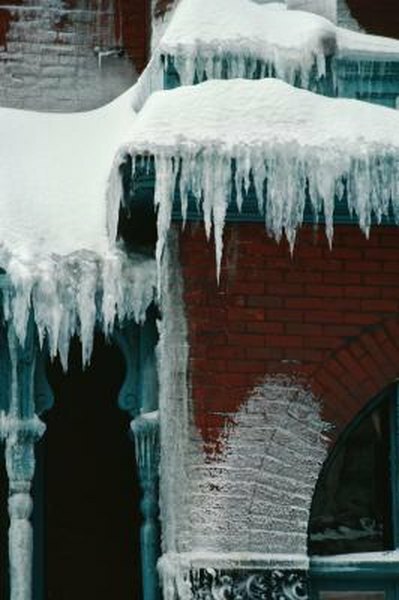 If melting ice leaks inside, your insurance should cover it. 3. How Much Will My Homeowners Insurance Cover for Water Damage & to Replace an Entire Kitchen Floor? Rain, snow, hail and lightning can all leave your house in bad shape. If the damage is expensive enough to call your insurer, you need an idea of how much the repairs will cost. If your furniture, carpets or electronics sat under a leak in the roof, you need to estimate replacement costs for them too. If the storm got inside the house, take an inventory of everything that it damaged, from carpets to kitchen appliances to clothes. Write down what you lost, what it cost and find out the current replacement cost. If you still have receipts for any of it, make copies. Take photographs of your ruined property to back up your claims and prove you really owned everything you're filing a claim for. Contact a contractor to get an estimate on how much repairs to the house itself will cost. The National Storm Damage Center recommends asking three contractors for cost estimates, which should include the cost of materials, labor and overhead. The insurance company's adjuster will make her own estimate, but she's looking out for your insurer, not you. Having a contractor's detailed report gives you a defense if the adjuster underestimates your damage. Take photographs of all the damage to your house, along with the contents. Then take immediate steps to prevent further damage. If the wind ripped part of the roof away, for example, cover it with tarpaulin to prevent more water coming in. More damage at this point will not translate into a bigger check. Keep your receipts for repairs and submit copies to the adjuster -- never give the originals -- along with your other papers. Your insurance should cover reasonable costs for short-term repairs. Even if the adjuster agrees with your estimate, you probably won't get all the money at once. It's a common practice to delay part of the payment until after you present the receipts from the contractor for repairs, or the cost of buying a new TV or couch. This is supposed to keep you from taking the insurance payment and spending it on something else instead of replacing your property at the agreed-on price. HouseLogic: Homeowners' Insurance: To Claim or Not to Claim?